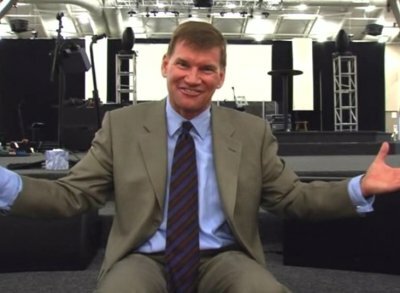 Ted Haggard wants you to watch Jesus Camp THIS MUCH!! 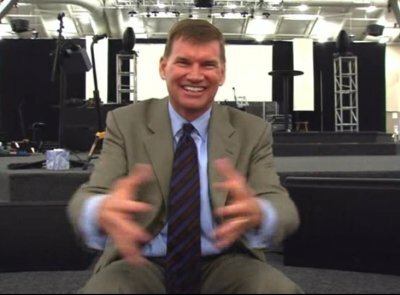 Seeing ol’ Pastor Ted was only one of many disturbing experiences we had watching the documentary Jesus Camp, which gives us a look into the bizarre practices of the Christian Charistmatic movement, and how it is wielded to forge new generations of believers. The documentary unfolds like a slow-motion train wreck, as we watch the emotionally manipulative church leaders indoctrinating young children with belief systems that are openly hostile towards good reason. I felt angry through most of the documentary, and pitied the poor children subjected to these manipulations. I also remain hopeful that the Charismatic movement of Christianity is not a typical sampling of Christian faith. If Jesus saw it, I hope he’d be seriously pissed. Another disturbing scene in the documentary was a group of kids being made to pledge their allegiance to the Christianized American flag: I pledge allegiance to the Christian Flag, and to the Savior for whose Kingdom it stands. One Savior, crucified, risen, and coming again with life and liberty to all who believe. Maybe our poor laws are no match for the untold number of people who desire to restore the long-divorced church and state. Jesus Camp is one of the best documentaries I have seen in a long time. Go rent it! And post comments on what you think of it. Figure 2: Pastor Ted demonstrates the preacher power move that has come to be known as the Meth Magnet. This entry was posted in movies, religion. Bookmark the permalink. Re: Jesus Camp Christians have as much right to vote as you pro-sodomite, pro-abortion anti-Christian bigots like you. You may think it’s funny, but it is not. You are right, it’s not funny – I should fill myself with hatred, and become more like you. Is this what it takes to be a modern Christian? Re: Pastafarians have as much right to pirate as you pro-pesto, pro-antipasti, anti-midgit bigots like you. You may think it’s silly, but it’s not. SAY THIS PRAYER: Dear Flying Spaghetti Monster, I am a sinner and am headed to eternal Olive Garden because of my sins. I believe your noodly appendage touched each of our lives to take away our hunger and take me to meatball heaven. FSM, I ask you now to come into my tummy and take away my hunger and give me eternal pirates. Ramen. Dear Jesus. It’s been a while since I’ve said anything to You, so I might have a lot to say. I know You’re very busy preparing the places of good Christian people in heaven, so I apologize for the length of this prayer. I would like apologize to You, Jesus. I would like to apologize for your people. You set about on earth with people to teach them to be fishermen of men, and told us stories of the kingdom of heaven and the glory of God. And it appears what these people have taken from Your message is to be fishermen of bigotry, and they tell us stories of hellfire and damnation, and by disagreeing with them we are sodomites. I cannot know Your mind, Lord, nor can I guess at Your feelings on these people. But I know how how I feel about them, and that is why I am apologizing to you on their behalf today. I would also like to apologize to You, oh Lord, for all the sodomites who apparently work for You. True sodomites who partake of the sins of the flesh with members of their own gender. I cannot guess at Your will on the matter, Lord. I do know the Law in part, and I do remember what Paul said. The only thing I know is that to say one thing and privately do another is wrong, its false, and I pray for the salvation of these people. I also pray that when confronted with these sins, that Your people can talk openly about the matter instead of responding with worldly indignation. And finally, Lord, I would like to apologize for Your people’s faithlessness. I believe it shows a tremendous lack of faith in Your omnipotence, Your power, and Your abilities when Your own people feel that they should resort to brainwashing children in order to give You good servants. Your spirit is mighty and ever-present, and I know this full-well. But You did not give us free will in order to be bent at such a young age, so that Your spirit would move on the hearts of people whose minds were given over to You possibly against their will. I don’t believe it glorifies You to have the deck stacked for You, and I don’t believe it makes for good witness to others who may know You. I hope for these people’s continual salvation. And I hope they will provide better witness for You. And I would like to thank You for my dad. His faith in You outstrips anyone I’ve ever met. I do not say it with pride. I say it with the hope that more people may learn from him as I have.